This dessert pairs nicely with chocolate sauce and roasted hazelnuts. Combine the milk, cream, sugar, and coffee beans in a medium saucepan and heat over medium until scalded (just before the boil). Cover, and turn off the heat to steep about 10 minutes. Taste for flavor and steep a little longer, if necessary, to fully extract the coffee flavor. Place the gelatin in a small bowl and add the cold water. Set aside to bloom, about 5 minutes. Add to the hot mixture and stir to combine. Pour through a fine-mesh strainer into a pitcher and then pour into ramekins. Place in the refrigerator and chill at least 4 hours. 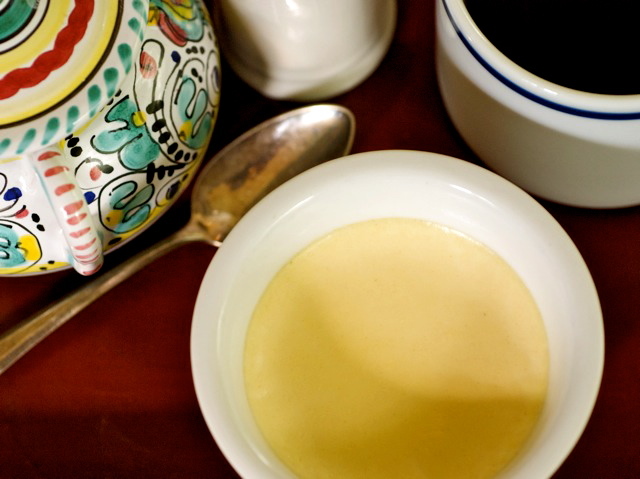 Serve in the ramekins or, if you prefer, serve on a plate: Place a paring knife into the custard right at the edge of the ramekin, and run the knife around the inside edge, cutting the panna cotta from the ramekin. Tilt upside down onto a plate and serve.